Missionary Victor Plymire buried his wife and son, victims of small pox, on a mountainside in China, but God used that sacrifice to give new life to a Chinese church decades later. Legendary AG missionary Anna Ziese's spent her life ministering to the lost and hurting people of China. Lula Bell Hough endured many hardships as a single missionary to China, including being captured by the Japanese and made a prisoner of war. Recently married and barely into their twenties, George and Margaret Kelley left everything behind to answer God's call to be missionaries to China. 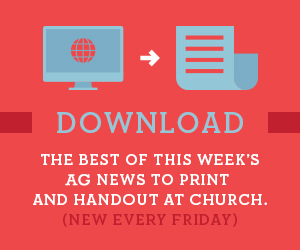 Compassion, missions, and giving have been hallmarks of the Assemblies of God since the beginning as this article from 1921 clearly illustrates. As a single missionary, Grace Agar followed God's leading to China where she not only led people to Christ but encountered the Holy Spirit for herself!